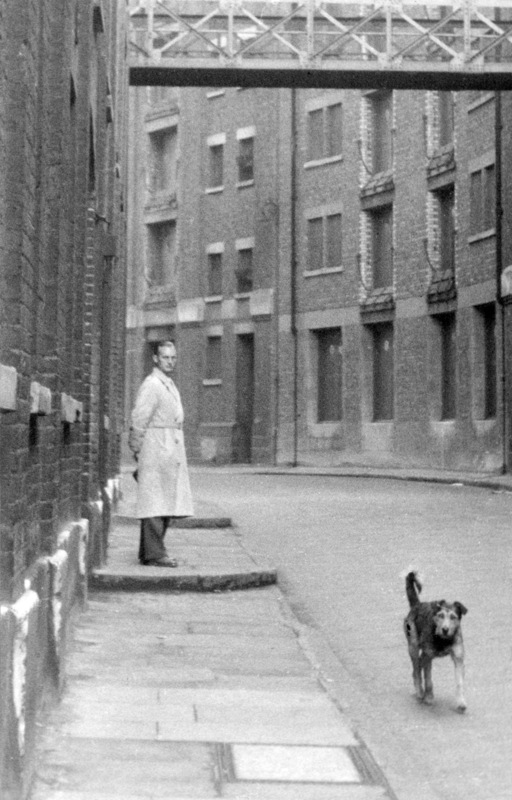 Hans Richard Griebe in his Westbourne Grove digs (self-portrait). 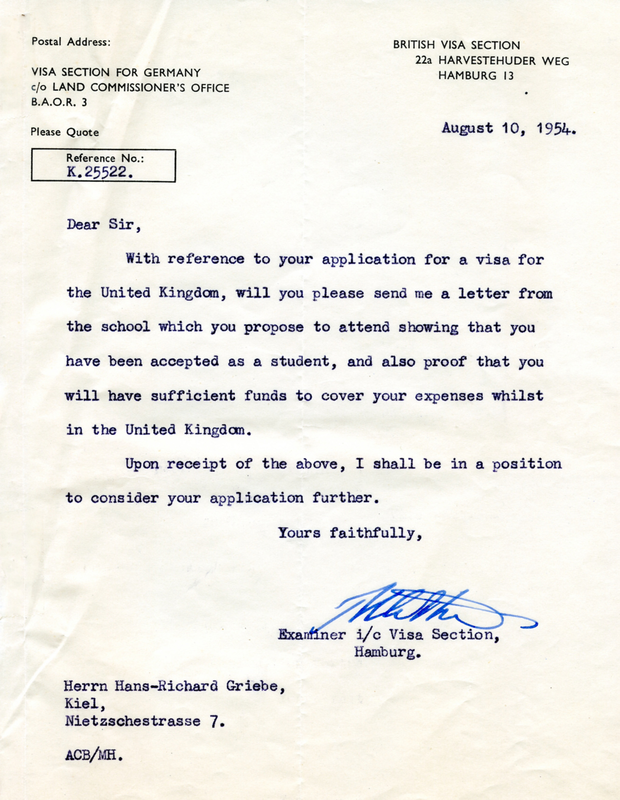 Hans Richard Griebe of Kiel went to London in August 1954 to take part in a short course of ‘Colloquial English’ run by the The London School of English in Oxford Street. He brought with him a 35 mm Exakta camera with a standard and a telephoto lens, and a medium format Rolleiflex camera. Hans Richard Griebe with his Exakta camera. From the album we can see he that is a very good illustrator. But it is his photography that consistently shines. 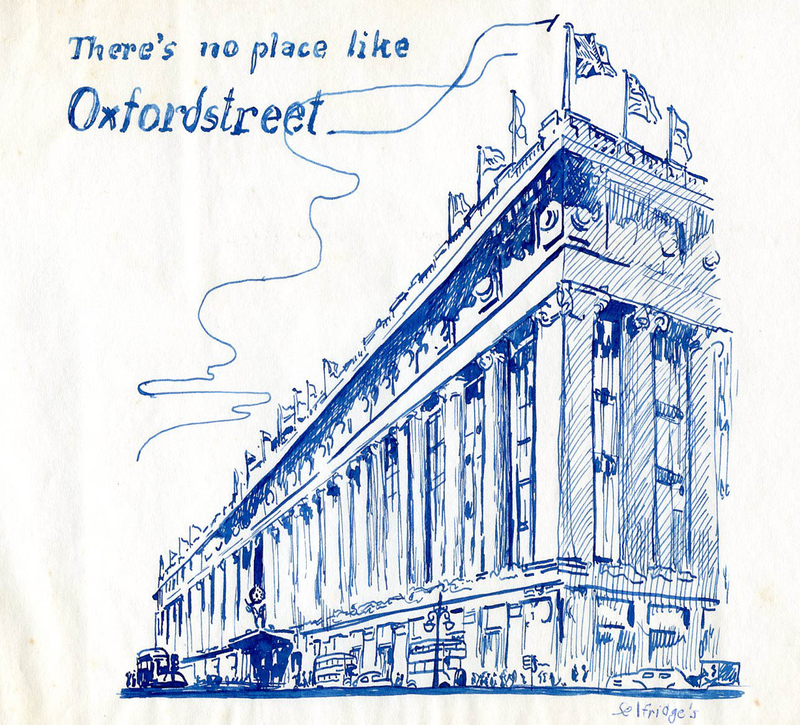 His album which he called Camera Abroad (in German: Exakta geht fremd) is an extraordinary record of a London emerging from the rigours of the 1940’s, travelling on its way towards Harold MacMillan’s ‘You’ve Never Had it so Good’. 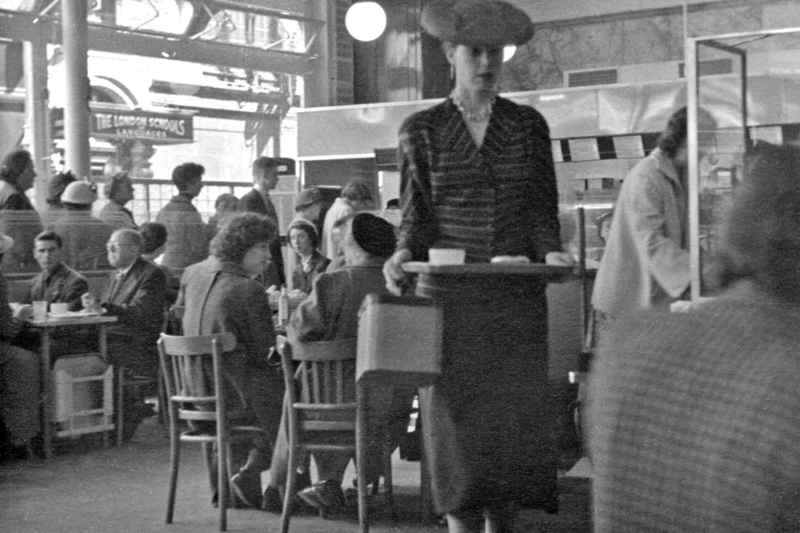 It also upsets notions of grey, wet foggy London Town of the early 1950’s. This is a mostly vibrant, stylish city, with the Festival of Britain only a few years old, and many of its features on the South Bank intact. We have at the moment no idea what his occupation was, or how he financed his eight weeks in London. His interest in battleships and boats, and coming from Kiel, suggests the possibility he had been in the Third Reich navy. 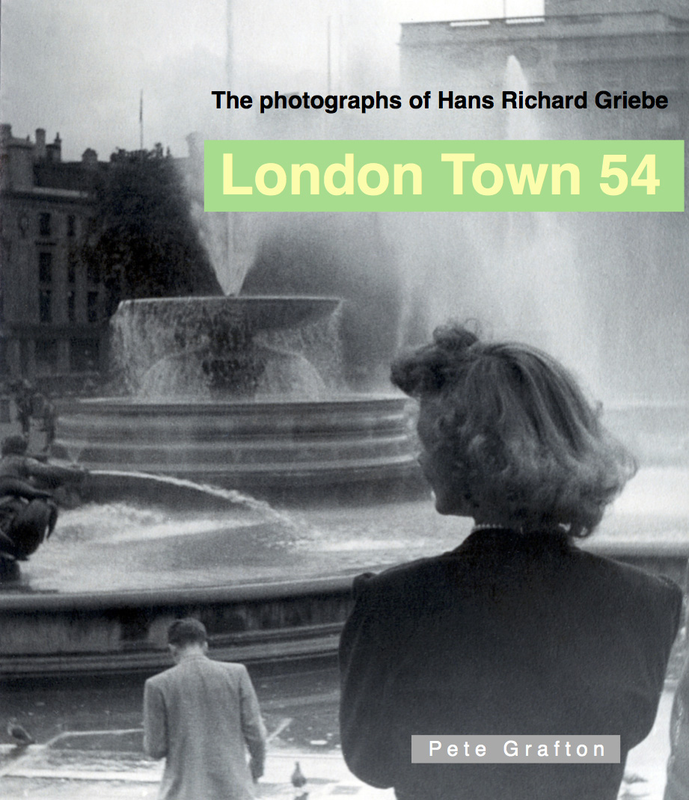 As with all great photographers he had the ‘eye’ – yes, for women, but also the ambience of London, and its people. 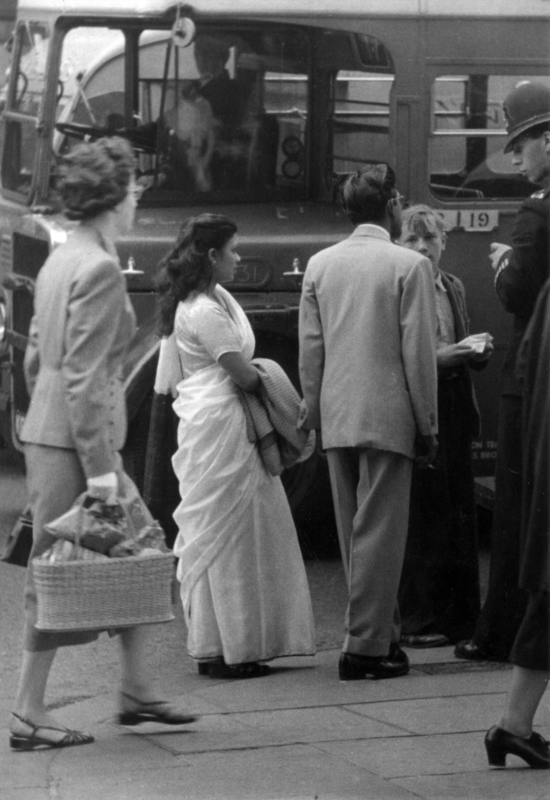 Hans-Richard’s delight in London’s women captures the wonderful styles of clothing that were around that Indian summer. 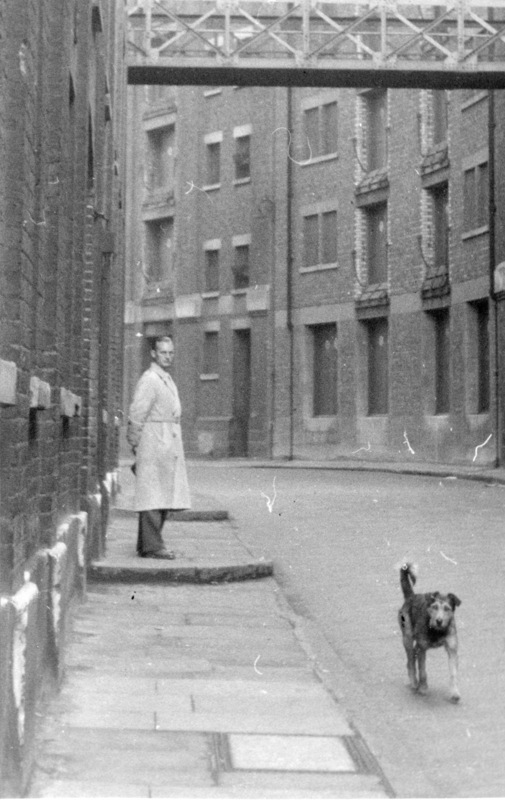 Although some of the sequences of women might seem disturbing – basically he was following them along busy streets – he had no difficulty in asking them if he could photograph them. He spotted Wendy when he went on a day trip down the Thames by boat to Southend. And then he asked her if he could photograph her, and took over ten photos of her. 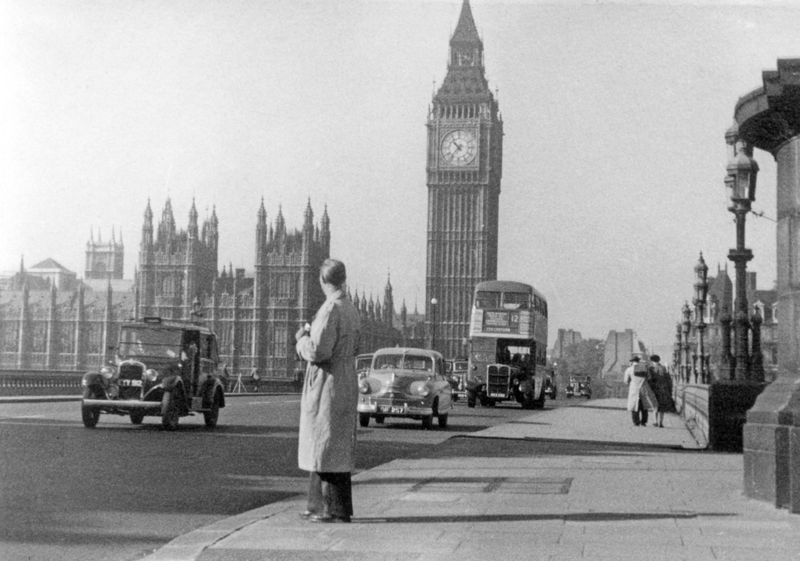 He used his Rollei often to photograph himself, on, for instance, Westminister Bridge. He’d put it on the pavement with a mechanical timer screwed into the cable release socket. Anyone who has done this will know how difficult it is to position yourself just right. Hans-Richard always got it right. Big Ben and Hans Richard Griebe. Self portrait. 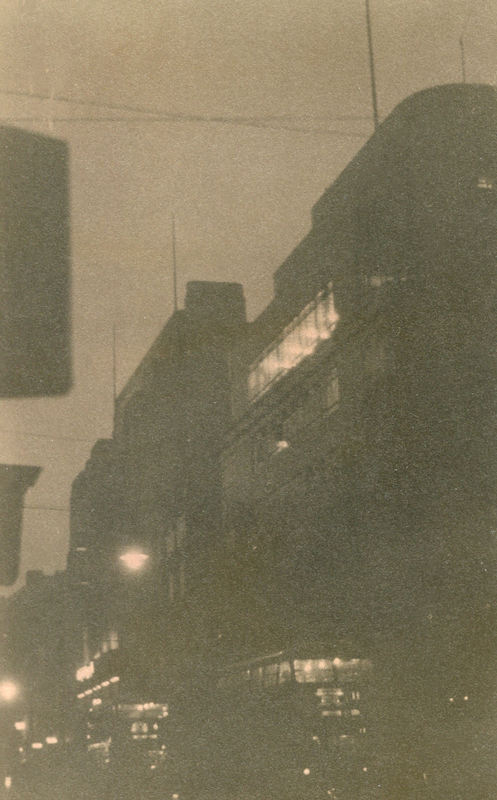 Photo cropped from a Rollei negative. 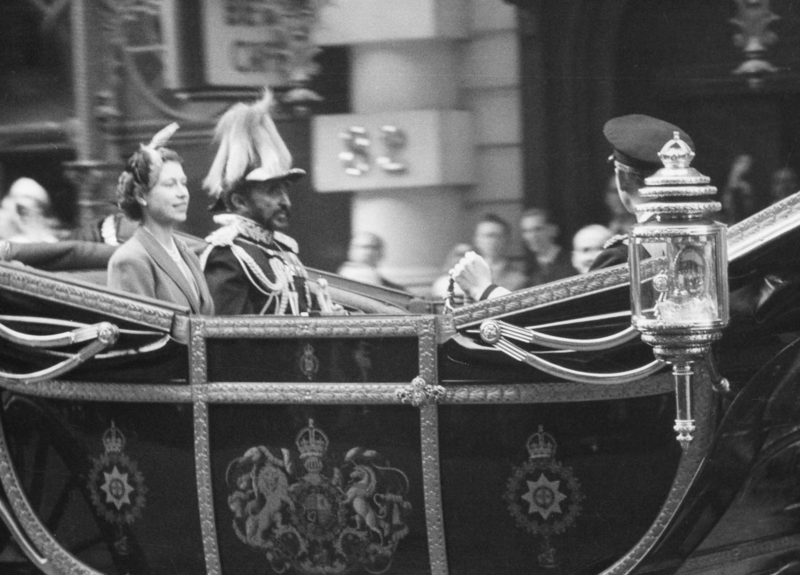 Using the Exakta with a telephoto lens he got a head and shoulders picture on September 15 of Queen Elizabeth and the visiting Emperor Haile Selassie that is the equal of any Fleet Street photographer. 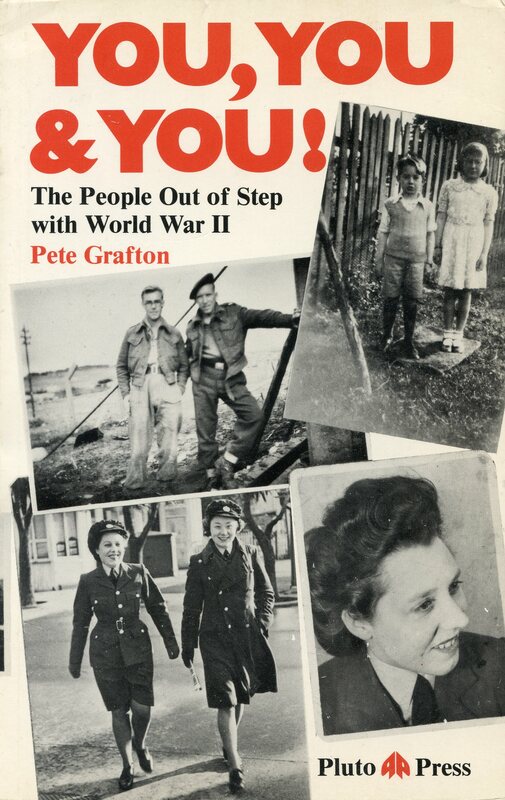 Like most keen photographers of his generation he developed and printed his own negatives (his negative thumb print – bottom right – is visible on one of the many photographs he took in Southend). ‘Wir bleiben in Southend’ is his photo essay spread over 14 pages featuring 45 photos and line drawings by him of what was East London’s pleasure ground. The model of the Royal Hynd, the mile long pier and it’s train, Madame Rene clairvoyant, the crowded sea front and beach, dripping ice cream cones and a placard protest against German rearmament, juxtaposed with a gent holding a placard demanding Rearmament of the Soul are some of the subjects. 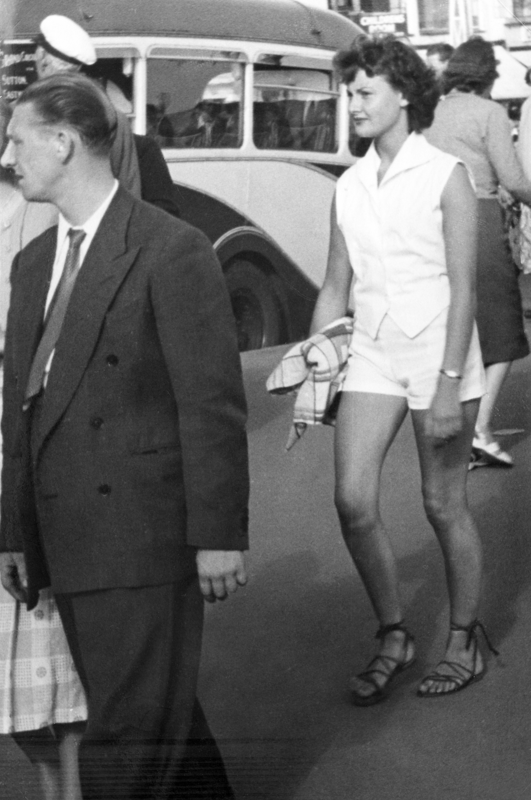 There is also a photo spread of Wendy, who posed for him in her shorts and blouse, and then shed those for bathing costume shots. Hans-Richard travelled down to Southend on the crowded Royal Sovereign, embarking at Tower Bridge. The photo essay on this section of the outing runs to 31 photos. ‘Pflasterkunstler und Sanwichmen’. Four photos on the page, none captioned. 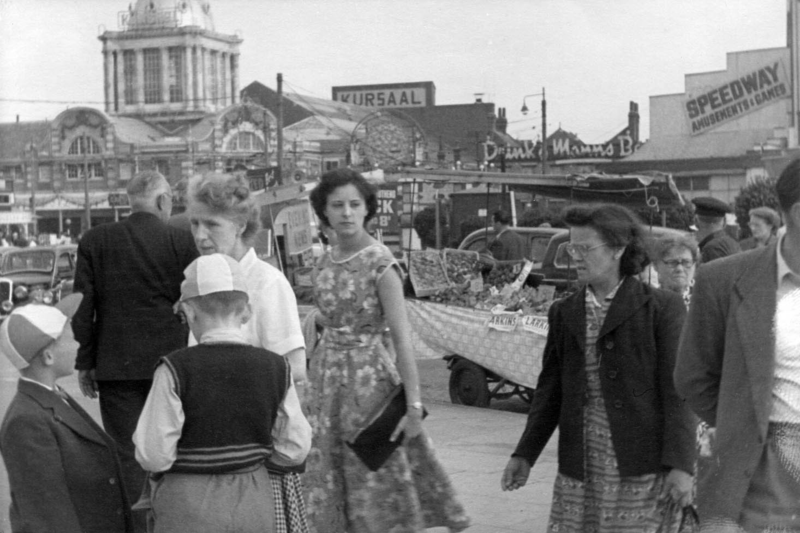 ‘Pall Mall East’ sign, top left. This is at the bottom of Pall Mall. This is a typical example of Hans-Richard grabbing the moment perfectly. 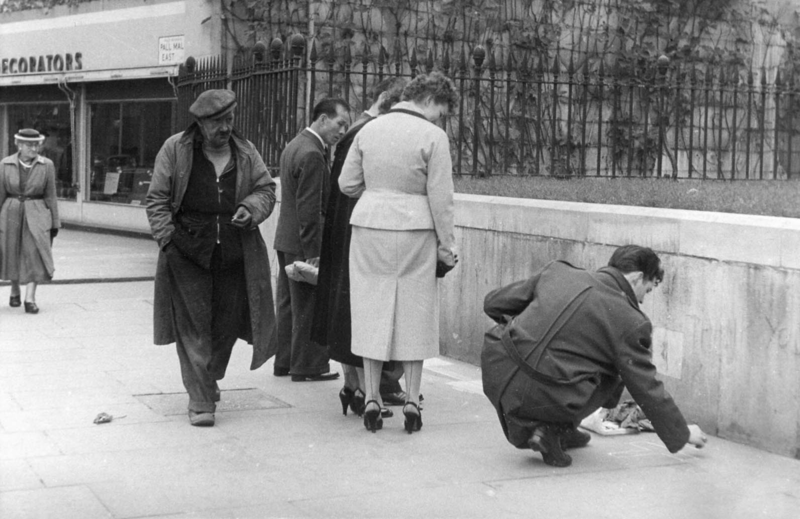 Another second and the downcast man with cigarette would have walked across the outlines of the people looking at the pavement artist (Pflasterkunstler). He knew exactly when to press the shutter. ‘Rush Hour. In German Rasch nach hause!’ There are three photos on the page with a nice little drawing, in his own hand, of a clock dead on 5 p.m. To take this shot he would have been walking directly behind them, trying to keep them in focus and, as he’s shooting into the light, at the same time metering for the shade. 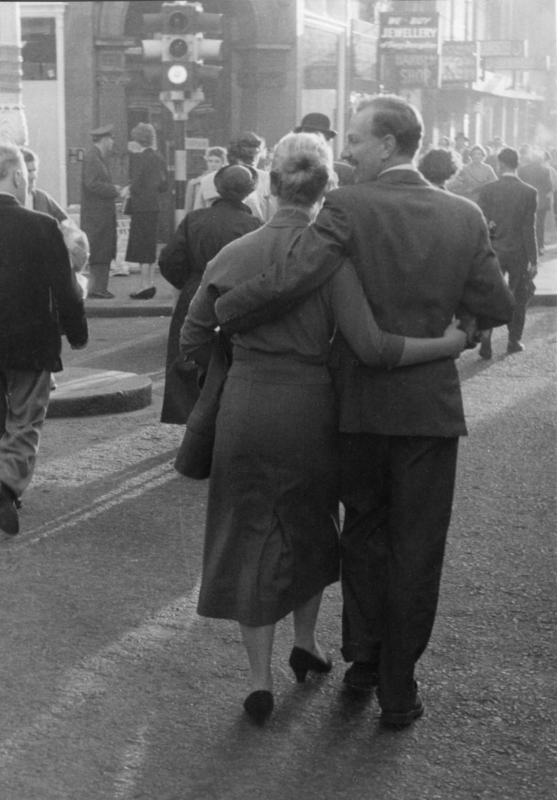 Bert Hardy in his My Life, London, 1985, says that this backlighting technique was one of his own favourites. Hans-Richard took several photos of Indians and West Indians, a novelty for a visiting German from Kiel. He also befriended Indian seamen at the Pool of London, and the album contains several portraits of Indian seamen and the pasted in address in India of one of them. 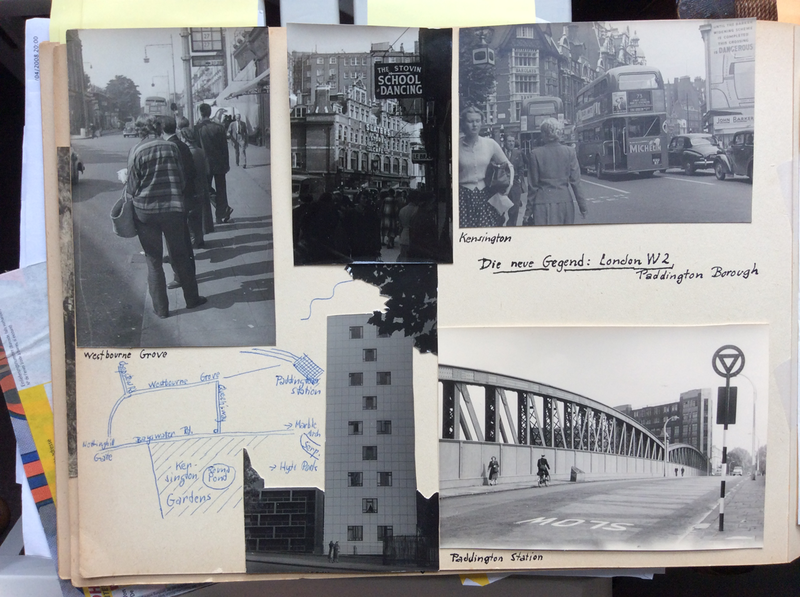 ‘London Docks und East End’ are 14 photos spread over 4 pages. 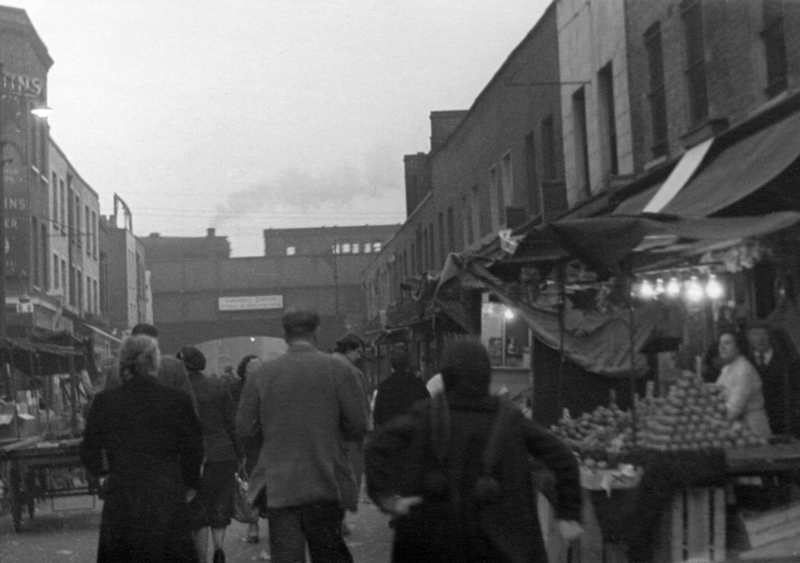 One striking photo of several in this section, is of a street market on a dull dark afternoon, with a barrow of oranges piled up pyramid style foreground, folk in the street and in the distance a railway engine pulling a passenger carriage over the elevated bridge. There is something about it that reminds the author of Andre Kertesz’s Meudon, Paris, 1928. 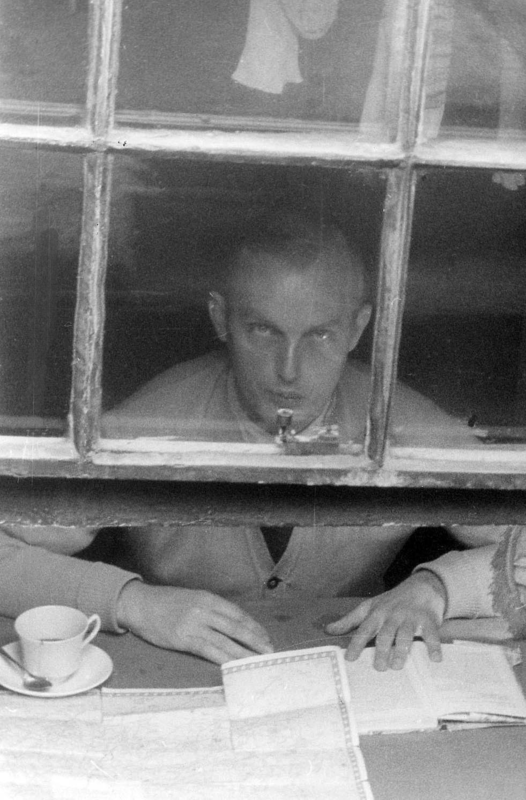 Hans-Richard attended the Colloquial English course at the London School of English seen through the window of the Lyons Corner House. He captioned the photo ‘Lyons. Im hintergrund School Entrance’. His focus on the stylish woman, of course, makes the picture. After six weeks in London it was time to go home to Kiel. 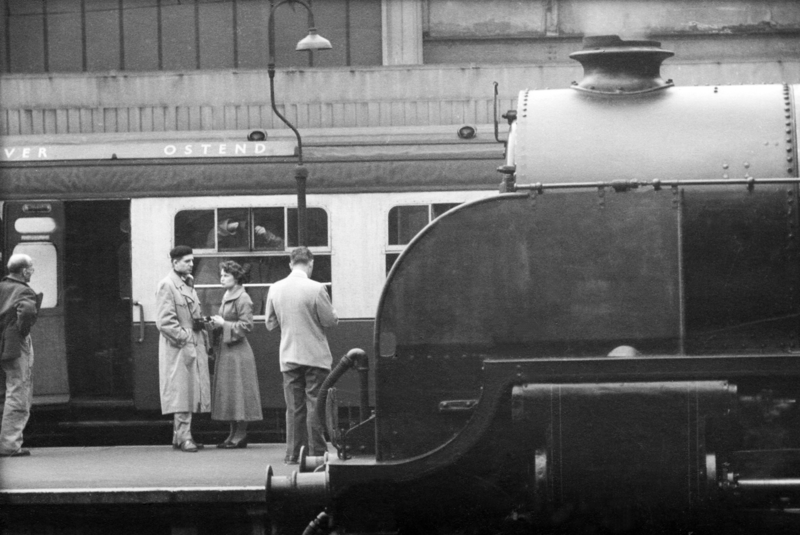 He left from Victoria railway station, catching the Ostend train. Again, this photo shows his photo journalist talent. To get the shot of the train he is departing on, he has walked down an adjoining platform at Victoria. Above the couple someone is trying either to slide open the compartment window, or close it. 2. Problems with the Photographic Prints. 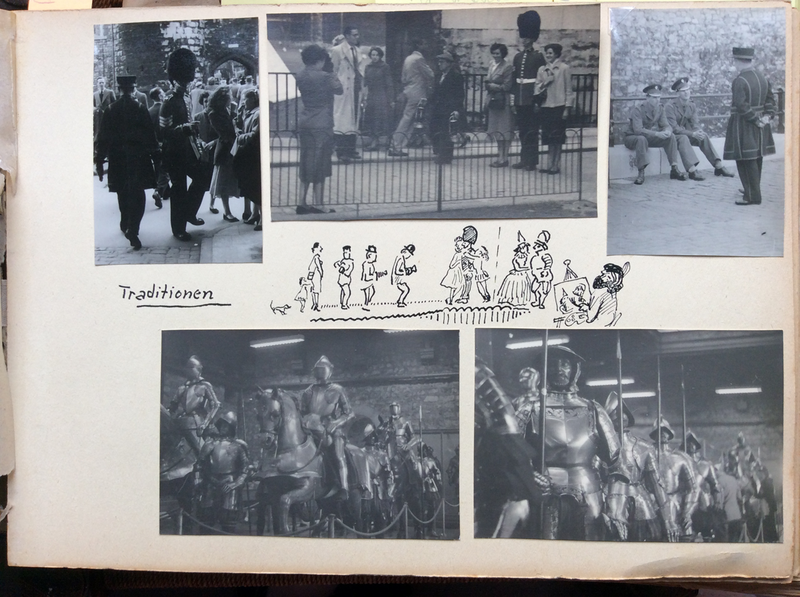 Hans Richard’s photo scrapbook which he called Camera Abroad (in German: Exakta geht fremd) runs to 154 pages, each page averaging 5 photos. There is a variation in print size starting from 85cm x 135cm upwards. 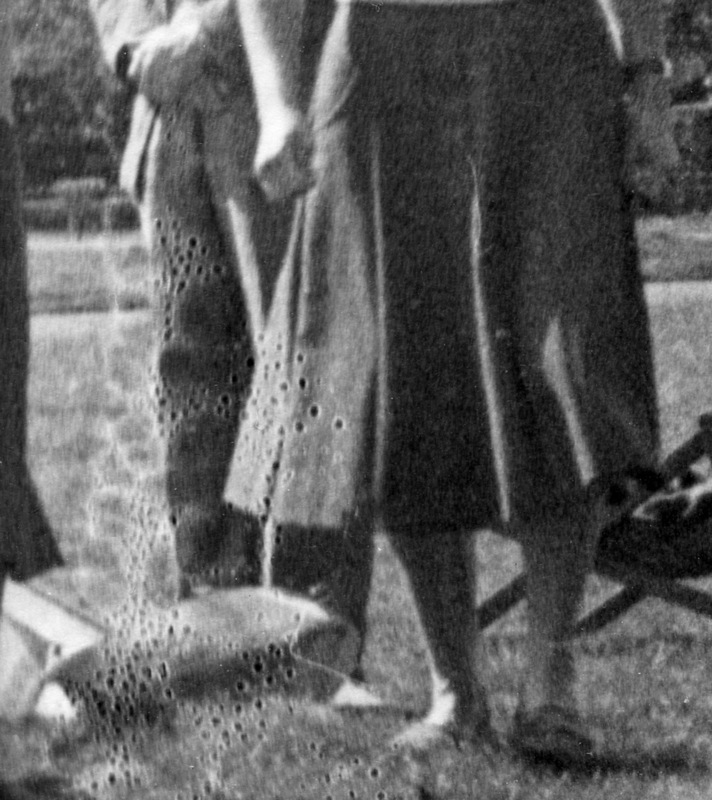 Assuming he used 35mm photo cassettes of 36 exposures (in the 1950s 20 exposure cassettes were also available) he got through around 20 to 22 cassettes during his stay in England. He used his medium format Rollei sparingly, and it is estimated that he got through only 3 to 4 rolls of 120 film. 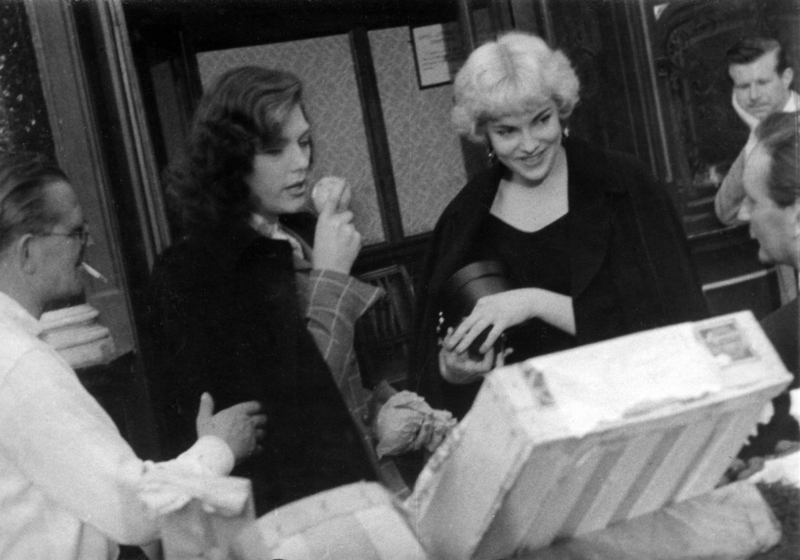 It is assumed that he developed his films back in Kiel as there is no indication that he had access to a dark room in London. The surprise is the number of his finger prints on the casually handled negatives (seen on quite a few prints) when he was hanging them up to dry. Most darkroom workers handle their film very carefully by the edge when taking them out of the developing tank and hanging the strip up to dry. 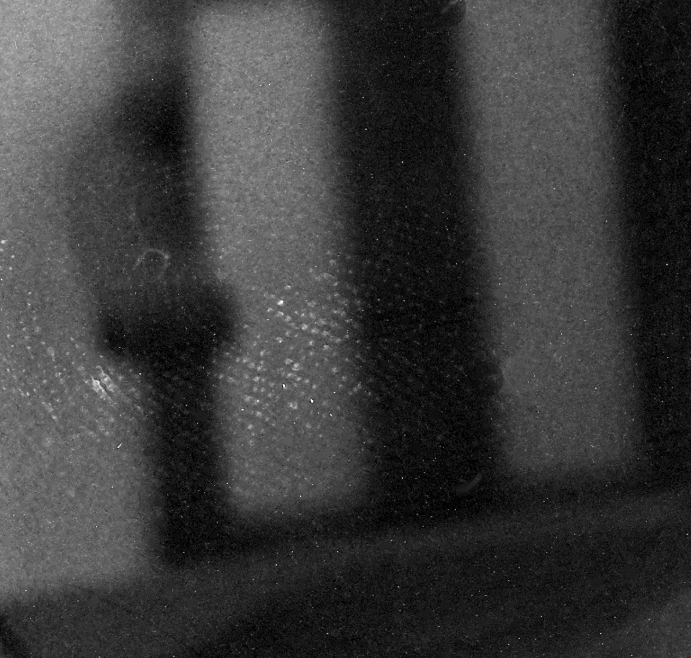 But with Hans Richard his finger print is within the frame – within the image. It may be that with so many films, and an enthusiasm to print as quickly as possible he rushed the process. There are also indications he speeded up the drying time of the negatives by applying heat, and it is this that seems to have damaged some negatives. Sometimes a print reveals that occasionally a strip of negatives were drying in a dusty environment. Dust is the darkroom workers’ enemy. 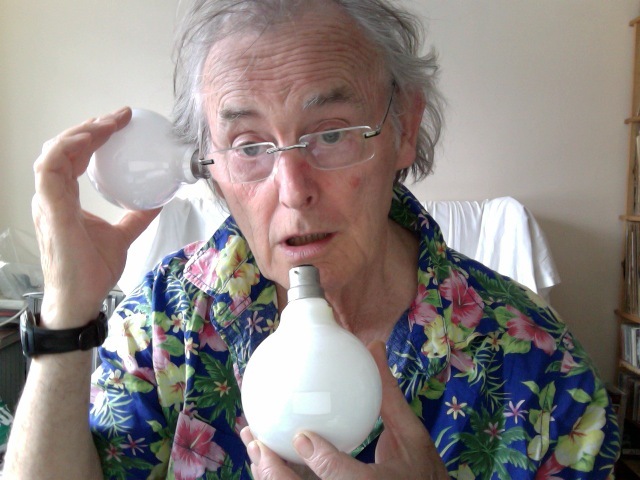 Still air is ideal in the drying area, but air turbulence can be caused by a warm light bulb, a shaft of sun, doors opening and closing….. In Hans Richard’s photo scrapbook there is huge variety of photographic printing papers that he used: papers with different finishes, different weights (single or double), and this has effected the finished quality of the print, and the problems of scanning them, and restoring them for online display. 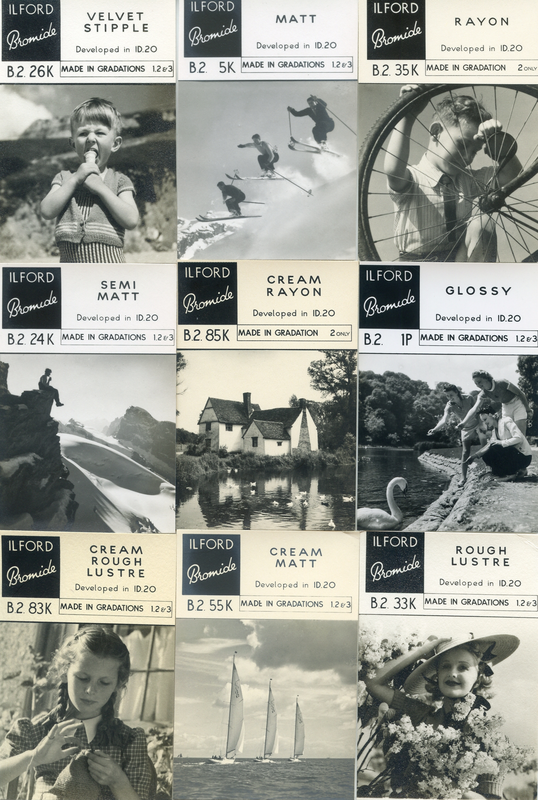 To give an idea of the variety of photographic printing papers in the 1940s and early 1950s below are reproduced samples from the British manufacturer Ilford, from that era. 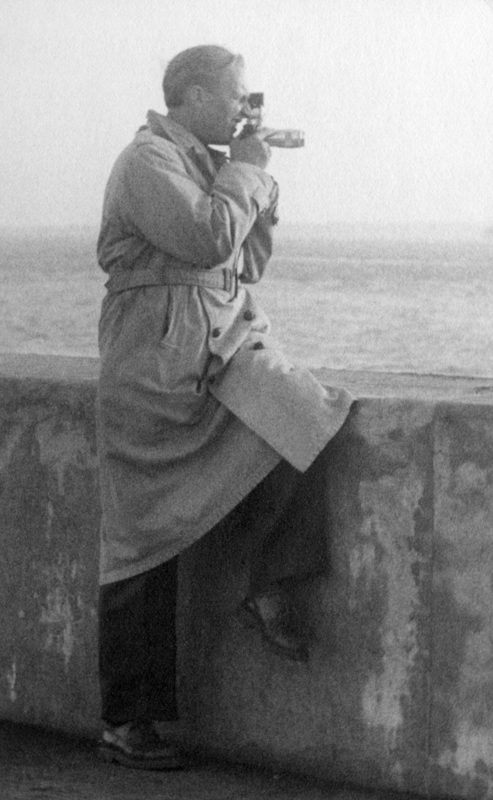 With the occasional exception of Agfa Brovira photo paper, all his photo papers have no mark of the manufacturer on the back, and nearly all his paper has been cut up by himself in the darkroom from larger sheets (using scissors rather than a guillotine), causing slightly irregular rectangles. The suspicion, too, is that he may sometimes have used outdated paper, that has caused problems with their longevity, or that they were not washed long enough to remove residues of the fixer. Living in a single room in a tenement building in Kiel it is probable that he did not have a dedicated darkroom. As these type of flats would have just one bathroom/toilet, and one kitchen for the occupants (say a family, plus Hans Richard renting a room – a set up the author lived in some years ago in Hamburg), he would have had a problem with washing his photo prints in running water, without inconveniencing the other members of the flat. 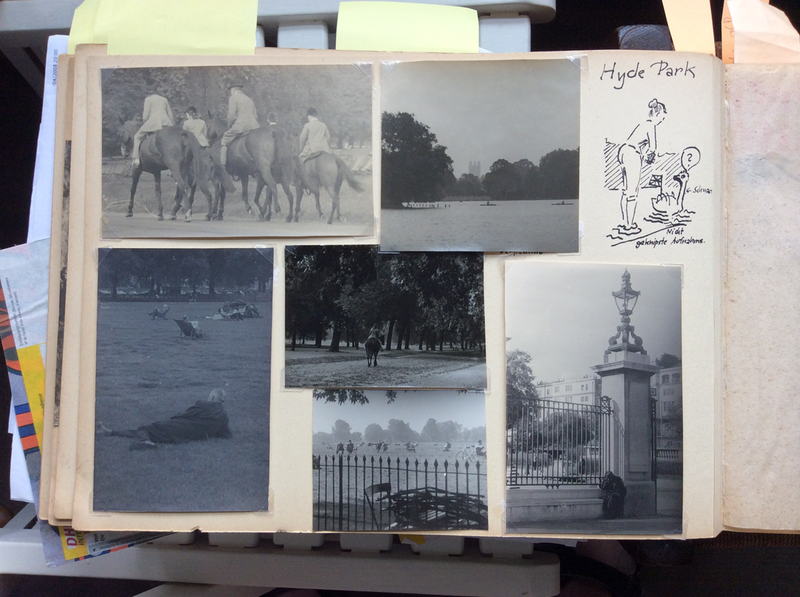 He may therefore have put his prints in basins of water, occasionally changing the water, which is not an effective way to remove photographic fixer from the fibre papers of the 1950s. Lastly, in some of his prints there is a darkening towards the edge, and sometimes a lightening, indicating an uneven spread of light. This suggests that at times the enlarging lamp was not centred properly in the enlarger housing. The Photo Scanner and Software programme used in the restoration of the photos: Epson Perfection V500 Photo (current March 2016 price between £170 & £190). Software programme: Photoshop Elements Version 9.0, which is included in the Epson Perfection V500 price. 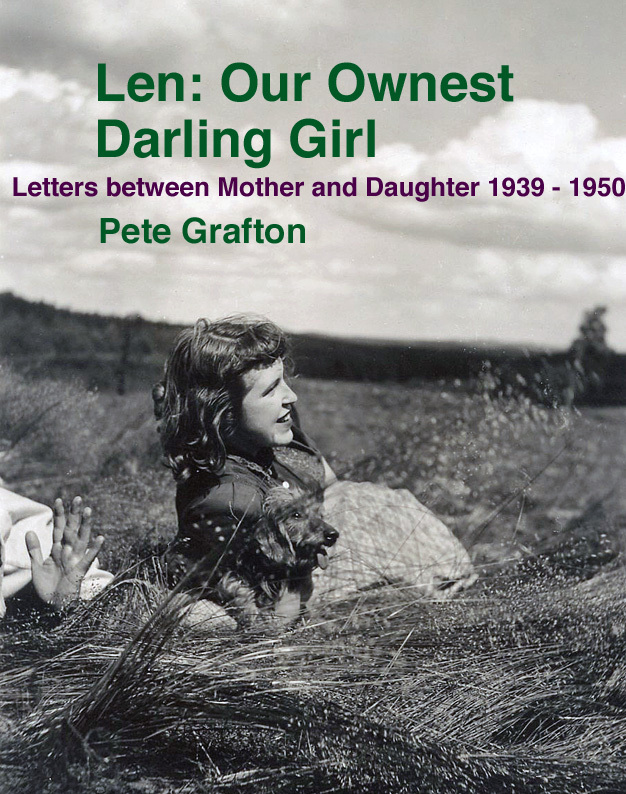 London Town 54 completes a loose trilogy by Pete Grafton that looks at Britain from the 1930s through to the early 50s. I find this section really helpful in understanding the scrapbook as a whole.